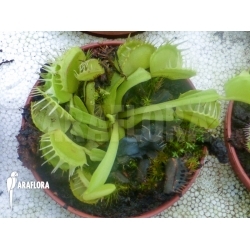 The Dionaea muscipula ‘Green dog’ owes its name to its traps that slightly resemble a grinning dog: this is due to the fact that its teeth have melted together. The Dionaea muscipula ‘Green dog’ has a bright-green colour with traps that can change to a very light red when exposed to plenty of light. Place the Dionaea muscipula ‘Green dog’ in a light spot and keep its soil permanently moist: in this way the Venus fly-trap will develop fully.